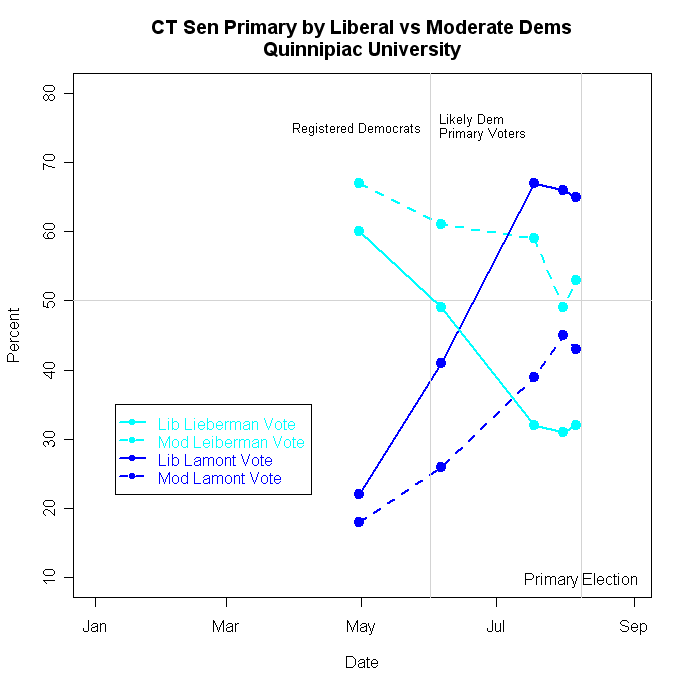 Two final polls in Connecticut show the primary tightening a bit but with Lamont leading by 6 points (slightly within the margin of error for the difference, which is 6.9%) in a Quinnipiac poll taken 7/31-8/06, and Lamont leading by 10 points (outside the MOE for the difference, 7.8%) in a Research 2000 poll taken 8/1-3/06. Some news outlets are excited over the shift in the margin from +13 to +6 for Lamont between the Quinnipiac polls taken 7/25-31 and the one done 7/31-8/6. One offers an interesting explanation for the shift "The why is fairly simple: Lieberman had a fairly good weekend of news coverage". He may have had a good weekend, but since most of the poll was completed BEFORE the weekend it isn't an entirely convincing explanation for the change in the poll! MysteryPollster Mark Blumenthal has a very nice post on the CT polls here. See his take on these and other issues. Nor is the shift as statistically exciting as it first appears. Lieberman gained 4 points while Lamont lost 3. But since 95 or 96 percent have a preference, what one gains the other almost exactly has to lose. That makes comparison of the margins look like bigger changes than they actually are. 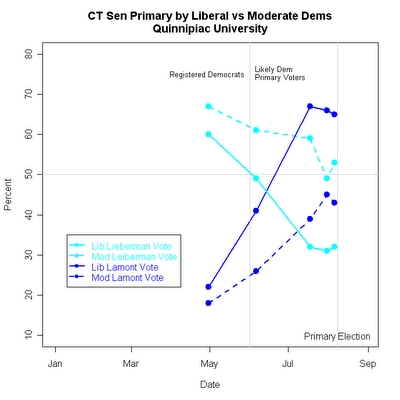 The two Quinnipiac polls are of 890 and 784 likely Dem primary voters. The margin of error for the CHANGE between these two polls for Lieberman is 4.75% and for Lamont it is 4.79%. Neither shifted by that much, so statistically speaking we aren't justified in concluding there was a turn towards Lieberman. (You can also calculate the MOE for the change in the margin between the two, which shifted from +13 to +6, a change of -7. The MOE for this change of margins, however, is 9.34%, so that isn't statistically significant either.) The Quinnipiac news release is notably silent on the statistical significance of the changes it reports, and not surprisingly journalists haven't grabbed their calculators before writing about the results. But that said, remember that polls rarely change by statistically significant amounts over a period of just a week or so. (This is a controversial statement among the brotherhood of campaign consultants and pollsters who will swear that such statistically significant changes do take place. I won't say never, but I will offer evidence that such large change is rare.) This doesn't mean that real trends are not shifting, just that the polls are too blunt an instrument to detect such shifts in trends without a number of polls or extraordinarily large sample sizes. So we are left to informed speculation rather than statistical inference. I'd not be surprised if Lieberman closed the race a bit at the end. Some do think he had a pretty good weekend, and voting against a long time incumbent is not something partisans normally do. It is the perception that Lieberman has betrayed his partisans (first on the war and Bush, then by rushing to establish an independent candidacy-- in effect refusing to cast his lot with those who had put him in office before) that has sapped his support. The first of these presumably has hurt him the most among liberals, but the second has hurt him among the moderates who make up his natural supporters. Lieberman's losses among his core supporters, the moderates, are less extreme but politically devastating. From a 67-18 lead 4/30 he dropped to a thin 49-45 margin 7/31, and has recovered a bit in the 8/6 poll to 53-43. (Note that what I said above about the lack of statistical significance of the changes applies even more so here. These shifts are great fun to look at and speculate about and interpret, just as I am about to do!, but they aren't distinguishable from random noise in the samples.) It may be that moderate Dems will have a hard time bringing themselves to vote against Lieberman and for Lamont, and so here at the end we'll see some upturn in support. It seems quite unlikely that the same dynamic would affect liberals, who have cut their ties to Lieberman by 2-1. And for a final word on the fallibility of polling. Above I pointed out that these polls have a margin of error of 3-4% on the percentages for each candidate, but that the MOE on the DIFFERENCE between Lamont and Lieberman (+6%) in the final Quinnipiac poll is actually about 6.8%. That is based on sampling theory alone. Add in uncertainty in correctly identifying likely primary voters, plus the usual response error, and the race is certainly close enough that we should not bet the entire farm on the polling. The consistency of recent results across the last 4 polls certainly increases our confidence that Lamont is ahead. But it is easy to overstate that confidence. 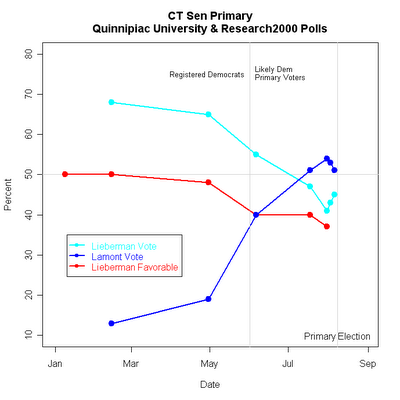 Likewise the Research2000 poll over the weekend found a +10 Lamont lead, which was outside the MOE of 7.8%. My analysis of several thousand polls since 2000 finds that as predictors of election outcomes, we need to expand the MOE by about 30-50%. 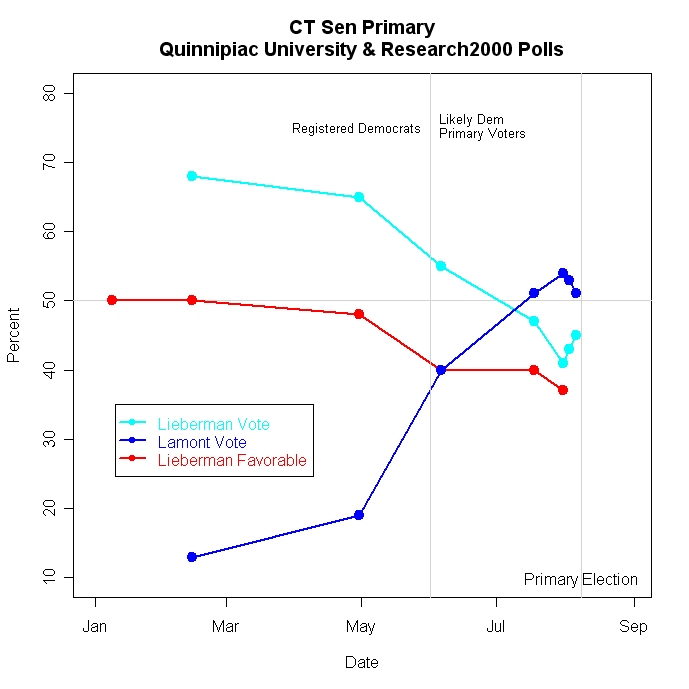 So while I believe Lamont is ahead, there is a non-trivial chance that the polls will be wrong-- say about 20% for the Research 2000 poll, and about 28% for the last Quinnipiac poll.